The clearest sign of Mitt Romney's enhanced standing after Mike Huckabee decided not to run for President may be his strength in the South. Last week we found him with a healthy lead among Republican voters in South Carolina and this week we find him ahead in North Carolina as well, a state where he had previously polled pretty poorly. Romney leads in the Tar Heel state with 20% to 18% for Herman Cain, 17% for Sarah Palin, 12% for Newt Gingrich, 8% for Tim Pawlenty and Ron Paul, 5% for Michele Bachmann, and 1% for Jon Huntsman. This is the second poll this week where we've found Cain doing better than Palin. He is the new darling of the far right crowd that has generally favored Palin. With voters describing themselves as 'very conservative' he gets 21% to 19% for Palin, 15% for Romney, and 14% for Gingrich. 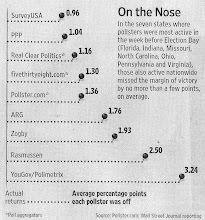 Romney holds the overall lead by cleaning up with voters who are either centrists or just slightly right of center. With moderates he gets 32% to 15% for Palin and 10% for Paul, with Cain registering at only 9%. And with 'somewhat conservative' voters Romney gets 21% to 18% for Cain and 15% for Palin. It's getting to the point where it hardly seems worth remarking on Gingrich's poor poll numbers but this makes another state where the plurality even of GOP voters rates him negatively- 47% to just 38% with a positive opinion of him. What makes that noteworthy is North Carolina is one of the few states where we ever found Gingrich leading the way in the Republican primary. That he now does so poorly in a state where he once did quite well speaks to the utter collapse of his candidacy. Pat McCrory has embraced the Republican legislature even as it's gone too far to the right for the tastes of most North Carolina voters and this might explain why: 44% of primary voters would vote for a 'more conservative' alternative to him next year compared to only 34% who say they would vote for McCrory given that choice. There's no questions GOP voters like McCrory- his favorability with them is 56/9. But there's still a lot of concern with the base that he's not sufficiently conservative and his actions over the last six months make it clear that he's trying to keep that 'more conservative' opponent from emerging. By contrast we asked this same question about Massachusetts Senator Scott Brown recently and only 25% of primary voters wanted someone to his right with 65% firmly committed to him. So it's not like Republicans always want a more conservative alternative. There are no signs of a serious primary opponent for McCrory on the horizon but if someone with fundraising ability on his right did decide to make the race, his nomination would not be nearly as inevitable as commonly assumed.